NEWS that the UN Food and Agriculture Organisation (FAO) had given Venezuela a diploma for its “notable and exceptional” efforts to curb hunger did not reach Joseína Rodríguez. Recently unemployed, and living with her family in a farm outhouse in the south-west of the country, she was too busy working out where her next meal was coming from. “Joseína” (not her real name) helps run one of the community councils that are the building blocks of the “socialist revolution” set up by the late President Hugo Chávez. “Chávez used to say that with the revolution everything would keep getting better,” she sighs. “I don’t know why this president (his successor, Nicolás Maduro) hasn’t kept the promise.” Sitting on an upturned bucket in the dusty yard of a farm that was taken over (before Chávez) by its workers, she says she used to work making meals for her neighbours, but stopped “because they can’t pay the prices I have to charge.” Staples reaching her community via the main state-subsidised food network cover only 200 of the 1,000 families who are supposed to benefit. The word “hunger” has been heard a lot in Caracas lately, mostly thanks to a hunger strike by Leopoldo López, the jailed opposition leader, and dozens of his supporters. Their demands—that political prisoners be freed, and a date set for parliamentary elections with foreign observers watching—have so far been ignored. This week some Brazilian senators were the latest senior foreign visitors to back the detainees. So the UN plaudit was a relief for the government. According to the FAO, which presented the diploma on June 8th, Venezuela is one of 72 countries that have reached the UN Millennium Development Goal of halving the percentage of their populations suffering from hunger. 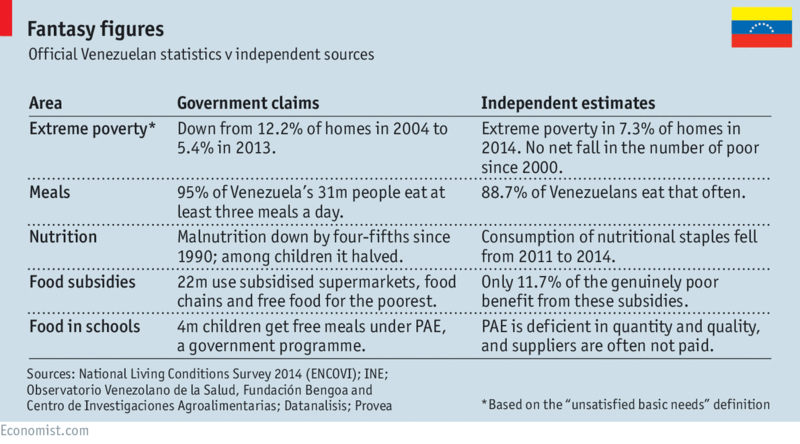 But the prize, based on government data up to 2012, comes amid growing evidence that the trend has reversed. In his speech to the FAO, Vice-president Jorge Arreaza cited the government’s claim that 95% of Venezuelans eat three meals a day. But in a survey carried out last year by three leading universities, more than 11% said they ate just twice a day or less. The FAO said it saw no reason to doubt the statistics it used. But many of the numbers needed for a full evaluation have not been published for years. The central bank has issued no monthly inflation or food scarcity figures for 2015. In November, even by official accounts a minimum wage only bought 76% of the food required for the average family. Independent estimates suggest three-and-a-half minimum wages are now required. About 40% of those in work get the minimum wage or less. Marianella Herrera, a nutritionist at the Fundación Bengoa, a private foundation, calls official data partial and inconsistent. “Other studies show an increase in malnutrition,” she says. 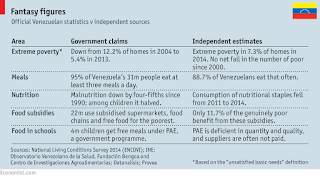 “Children are showing up in hospital emergency wards with severe malnutrition, and some are dying because of a lack of basic supplies.” The government’s own figures, which show it reached the UN target for reducing malnutrition in children by 2008, indicate that by 2013 Venezuela was close to crossing the line again, in the opposite direction. We understand that the Geneva Convention and its protocols are the cornerstone of international humanitarian law, actually our country face a system that has encouraged, and allowed, barbarism against civilians and militaries, 57 Venezuelans have been murdered protesting peacefully against the extermination laws, there are over 100 political prisoners. Right now, politicians and students prisoners have 150 hours in hunger strike demanding their immediate release. 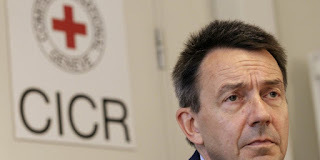 We are writing this letter to you to urgently request to the Assembly and Council presence of the ICRC in Venezuela in order to visit and assist all political prisoners, students, tweeters and military victims of bloody repression, because you are guardians of international law. We think your visit will be the beginning of the end of the persecution and repression against Venezuelan citizens, in compliance with the Geneva Convention signed in 1949 , because today all our human rights in Venezuela are being violated. We are young Venezuelans who are suffering constant repression attacks in the streets, in and out of our universities, workplaces and, we also fear the health of our friends who are unjustly deprived of their freedom, due to procedural delays, forcing their families to get naked (1), conducting violent searches, and subhuman prison spaces as "The Grave" and "The Tigrito". Sending this letter we fear for our lives, and our families could be at risk for exposing the situation to you. (1) When someone visits them, the visitor, in many cases, is forced to get naked.